"Failure is not in falling down but refusing to stand up again....."
An old Chinese proverb. The garden group has over the past two weekends worked hard on the ammonite shaped path in the Jurassic garden. We have had to move away from the original drawings as the spiral on the shell did not in our minds fit the true shape of an ammonite. So we had to resort to mathematics. A picture was sourced and a grid drawn over the sketch and from there we managed to move forward. This part of the project is taking up a lot of hours. There is a lot of measuring and levels to be taken but at last the group feels that they can see the light at the end of the tunnel. With the ground being rock hard and many a hidden obstacle in our way- tree roots or buried asphalt paths -we are slowly progressing. 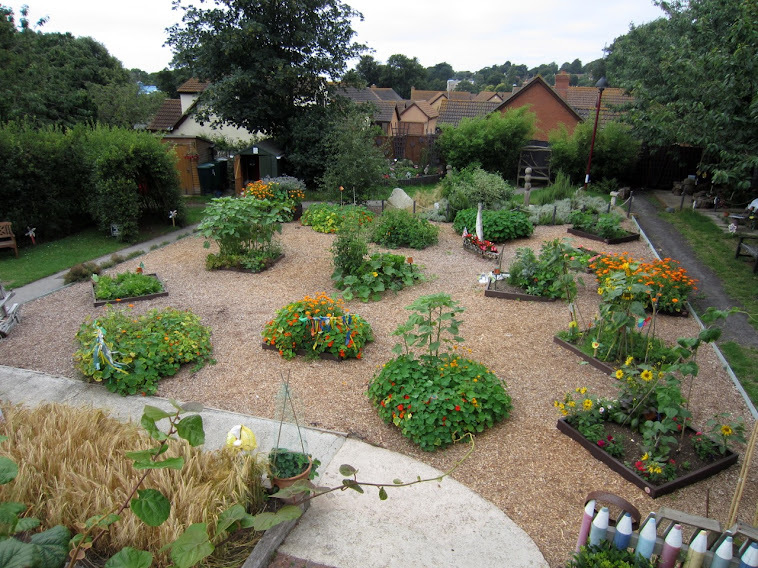 There is still a lot of colour in the garden as can be seen from walking around the various class plots. Also a lot of produce is just beginning to ripen. This year the tomato plants have avoided the blight which last year devasted the outdoor plantings. Late this afternoon there were four species of dragonfly in the garden. Southern Hawker, Emperor, Migrant Hawker and Common Sympetrum. The pair of Common Sympetrum were seen mating and later egg laying in the pond. Not much left of this cabbage plant! The Venus Fly-trap plant has had a growth spurt! A new butterfly species was added to the garden list this week. 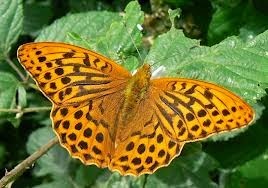 A Silver-washed Fritillary. A large and very attractive species. "In my opinion all things in nature occur mathematically"
he appears to be correct!